Mozilla, the organisation behind the Firefox browser, has announced it will start selling low-cost smartphones in India within the "next few months". Speaking to the Wall Street Journal, the firm's chief operating officer suggested the handsets, which will be manufactured by two Indian companies, would retail at $25 (£15). 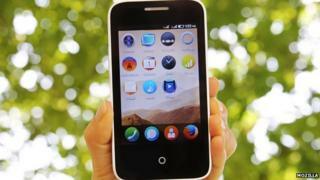 They will run Mozilla's HTML5 web-based mobile operating system, Firefox OS. The announcement comes as mobile manufacturers increasingly attempt to break into emerging markets, where smartphones are less widespread, mainly due to their high costs. Mozilla, which currently works with mobile manufacturers ZTE and Alcatel, among others, has partnered with two of Indian based low-cost handset makers, Intex and Spice, to develop the low-price phones. "The platform will give us an edge in upgrading buyers from feature phones to smartphones while making it affordable for the mass market," said Intex's head of mobile business, Sanjay Kumar Kalirona. Mozilla, which is a not-for-profit foundation, also announced a deal with Chunghwa Telecom, Taiwan's largest mobile phone operator, to support Firefox OS devices.